Most of us have heard the well publicised statistic that one in four people experience a mental illness at some point during their life. Even more alarming are figures which reflect that mental disorders account for 22.8% of total disease burden, compared with 15.9% for cancer and 16.2% for cardiovascular disease, (WHO 2008). Mental illnesses are common. It is likely that you know someone who has suffered or who is currently suffering from one of the most commonly diagnosed illnesses which include depression, anxiety, obsessive compulsive disorder, schizophrenia, personality, addiction and eating disorders. Racism is not new by itself as it is wrapped in identity of the self and associated privileges that an identity can provide. Sir, Libby Purves is right to highlight the internalised racism often seen in a large number of individuals no matter how liberal they may claim to be (“That racist voice in your head is not the Devil”, Opinion, Sept 3). This largely remains hidden due to social constraints but occasionally emerges unbeckoned. Carter’s report on Shafilea Ahmed‘s death (Parents jailed for life, 4 August) highlights a tragedy for the communities and her siblings but it also raises broader complex issues for society as well. Carter is right in her observation about cultures in collision. In the late 1990s we published a series of studies on rates of self-harm across communities. These studies showed rates of self-harm in south Asian women aged 18-24 were three times higher than their British counterparts. They were more likely to attempt self-harm as a result of domestic violence, alcohol abuse and cultural conflict. This is the vulnerable age when individuals start to assert their identity and move away from home and individuate. Prior to writing the reports we presented these findings to members of south Asian communities, largely women in public meetings in south and west London. Women and men who attended responded by saying that they knew this was going on and urged us to educate parents, peers and the wider community about the causes. We produced educational leaflets which in a follow-up study revealed that the knowledge about self-harm and potential sources of help had gone up. Education about cultural values and the role that cultural assimilation can play is critical if future tragedies such as this are to be avoided. ‘We will be left with a dangerous vacuum of help,’ warns president of Royal College of Psychiatrists. A leading psychiatrist has warned of the ‘massive problem’ of depleting numbers of mental health doctors. 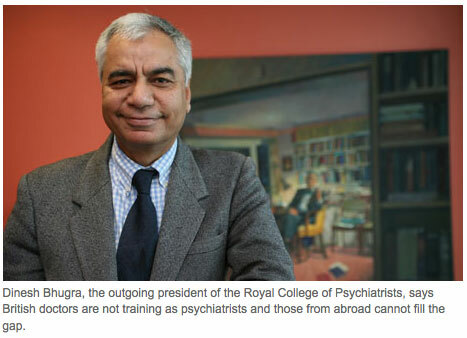 Professor Dinesh Bhugra, the outgoing president of the Royal College of Psychiatrists, said not enough British doctors were training as psychiatrists while visa restrictions meant foreign doctors could no longer fill the gap. He said 14 per cent of consultants posts in the UK were either unfilled or filled by a locum. An additional 209 consultants intended to retire or resign soon. ‘This is a huge, a massive problem,’ Prof Bhugra told the Guardian. ‘We will be left with a dangerous vacuum of help for people with mental health disorders or will be forced to get special dispensation from the Government to recruit heavily from countries who can ill afford to lose their mental health professionals. Mental health services are dangerously understaffed and overcrowded, the outgoing president of the Royal College of Psychiatrists has said. Professor Dinesh Bhugra said that failing psychiatric wards were discharging sick people back into society who remained a risk to themselves and to others. He warned that there was a “huge, massive problem” of depleting numbers of mental health doctors in the UK because not enough British medics were choosing to train as psychiatrists and visa restrictions meant that foreign doctors could no longer fill the gap. A survey by the royal college found that 14 per cent of consultants’ posts in the UK were either unfilled or filled by a locum, and an additional 209 consultants intended to retire or resign soon. In an interview, Prof Bhugra said: “We will be left with a dangerous vacuum of help for people with mental health disorders or will be forced to get special dispensation from the government to recruit heavily from countries who can ill afford to lose their mental health professionals. Overcrowded and understaffed psychiatric wards are leaving patients fearful for their safety and unable to make proper recoveries, according to a damning assessment of Britain’s mental health service by its lead professional body. Many have shown symptoms of anxiety and depression such as sleep disturbance, a sense of hopelessness, lack of appetite and tearfulness. Professor Dinesh Bhugra, Dean of the Royal College of Psychiatrists, and one of the authors of the study, said: “These findings are extremely worrying. We have discovered that a normally robust and highly-committed group of professionals is feeling very demoralised. “The Government has a moral obligation to ensure that the next generation of doctors does not feel disenchanted with their profession. The mental health care that people from black and minority ethnic communities receive is a ‘disgrace’, according to a seminal inquiry report. But is race equality training really the answer?